As a family, we’ve started a new and busy school year full of optimism and enthusiasm. After taking a week to work out scheduling kinks and failed potty schedules, we’ve finally established a realistic back-to-school routine that works well for everyone. I spend my days as an Emergency Manager for the city and my evenings as the best Dad and husband I can be. When it’s time for dinner after a hectic day, I try to create quick and healthy meals for my daughters that is not only packed with nutrition, but also full of flavor. As a family, we’ve been fortunate enough to travel constantly, and we incorporate those unique experiences and seasonal flavors into the meals we create at home. Whenever possible, I let the kids help with creating dinner. They LOVE cooking with Dad and I love it as well. I cook with whole, fresh ingredients and try to challenge their developing palates with new flavors and foods. My daughters also have a love for vegetables, which I like to creatively incorporate into recipes for a healthy boost. Cooking with my daughters is the most effective way to teach principles of good nutrition and healthy eating. Many studies show that children are more likely to try new foods when they have a hand in preparing them. 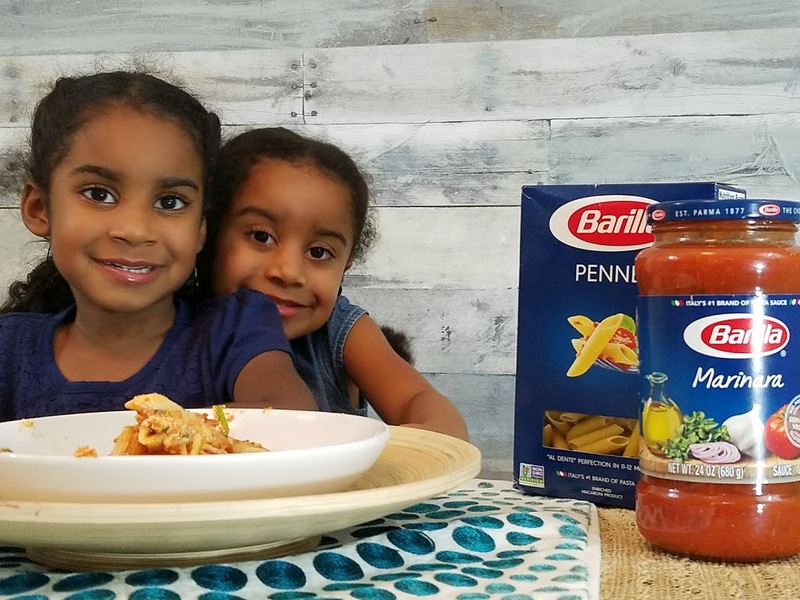 That’s why I wanted to create a dish with Barilla® Barilla Marinara sauce that also included two of their favorite ingredients – goat cheese and baby spinach. Here’s the great thing about Barilla® Blue Box pasta and Barilla® sauces. They deliver delicious Italian-inspired meal solutions that fill your family’s tastebuds with a with beautiful texture and flavors to make mealtime meaningful and downright delicious. With 38 pasta cuts and 14 sauce varieties, the combinations are nearly endless!. Back to school season is busy, hectic and full of surprises. Dinner is now the easiest part of the day.. Barilla® offers stress-free meal combinations, that put me and my family at ease with their simplicity, and Barilla’s delicious taste and perfect texture will have the family coming back for seconds….and thirds! In our home, the kitchen is a place where experimenting is not only acceptable, but encouraged. Our home and kitchen is a safe place that will allow my daughters to grow and become more self-confident in their skills and abilities. That’s one of the reasons I love to have dinner as a family every night. It is the best time to connect and share a meaningful meal with the ones you love. I also love a good challenge. Along with a few other Dads, I was asked to create an amazing meal with my kids in 30 minutes or less. My magical combination of fresh spinach with creamy cheeses, masterfully tucked into Barilla® Blue Box Penne and Barilla® Marinara sauce is unbeatable. My recipe is below. Enjoy! Preheat the oven to 375 degrees F. Generously butter a 10 x 13-inch baking dish with 1 tablespoon of butter. Set aside. Bring 8 cups water and 2 teaspoons salt to a boil in a large pot over high heat. Cook pasta according to box directions. Meanwhile, in a separate bowl, gently blend in garlic, parsley, spinach, and all cheeses (ricotta, mozzarella, parmesan and goat cheese). Once the water is at a rolling boil, add the penne and cook, until al dente. Drain, and return to the pot. Spread the pasta in the prepared dish. Bake until the cheese melts, about 10 minutes. Serve and enjoy. I have partnered with Life of Dad and Barilla Pasta for this promotion. Looks delicious! Also, your daughters are too cute. Looks like they had a blast cooking with you!